Following a brief retirement, Shane Bishop returns to the west coast of the United States to investigate the disappearance of his estranged daughter, Iris. Before vanishing, Iris gets mixed up with The Church of Solarism, a dangerous and mysterious new-age cult with its sights set on taking over the United States and installing a Fourth Reich. I was provided with a copy of the novel in exchange for an honest review. Following in the footsteps of The Spartak Trigger, Idol Threat is another exercise in meta-fiction (think Marvel’s Deadpool series) where the novel’s chief protagonist is very much aware he exists within a fictional story. In less capable hands, this manner of storytelling could easily backfire, but Allen takes great care to use these moments sparingly. In addition to the main character’s continued acknowledgement of his fictional existence, Bryce also throws in a plethora of footnotes that poke fun at his own writing and to also foreshadow future events in the story. The footnotes led to some of my favorite parts; a few of them were hit or miss, but there were moments where I laughed out loud causing a few strange looks from customers in coffee shops. Have you ever seen Inception? You know, that movie from a few years back where the characters would go into a dream, and then into the dream of a character inside that initial dream? Well, in Idol Threat, Allen offers up a book, inside a book, inside another book. I’m not sure how often this is used, but in the hundreds of books I’ve read, it’s not something I’ve ever encountered. I loved this right away. In fact, that third level novel, by design, had some of the worst prose I’ve ever read – you need to read it yourself to believe it. I can’t do it justice myself by offering up a description. 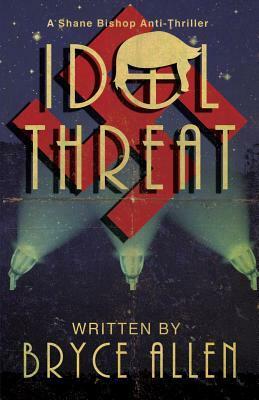 Idol Threat is an off-the-rails read that offers up tongue-in-cheek take-downs of Scientology, the far-right and over-used storytelling tropes. Honestly, although a good read itself, I don’t even know if the first book is necessary, but if you’ve read The Spartak Trigger, you’ll enjoy the sequel.